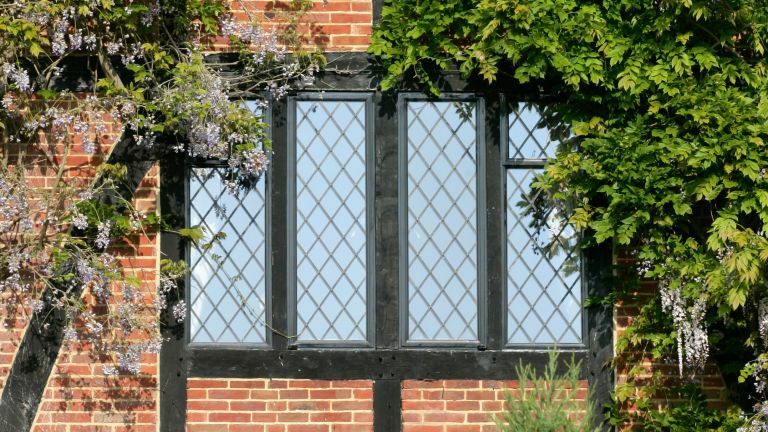 Leaded lights make up some of Britain's earliest surviving windows, dating back to medieval times. As glass could only be manufactured in small pieces, the leading allowed for them to be joined together to form a larger window pane. The basic design of this type of latticed window remained largely unchanged for centuries and even today is still used for new stained glass. Leaded light windows are found in buildings of many periods and should be carefully repaired, especially if the windows are old. Leaded lights consist of a framework of H-shaped lead strips, or cames, that join the glass pieces – usually in diamonds or rectangles. Except for the smallest, these are supported by metal bars or a framework called a ferramenta (from the Italian for ironmongery), historically made of wrought iron, fixed into the masonry. Medieval cames were cast in moulds with any uneven surfaces shaved away, leaving a distinct, faceted profile. From the 16th century, cames were produced by extruding lead through a mill. As a sign of authenticity, you may find names of manufacturers or dates impressed into the lead on the flat ‘heart’ between the H-shaped flanges. Leaded lights can last for hundreds of years with only minimal care. Loose or leaking glass may be re-sealed within the leadwork using glazier’s putty – a mixture of linseed oil, whiting and white cement. Broken or cracked glass can be replaced on a small scale by bending back the flanges of the cames to insert new pieces, and re-sealing. Sometimes lead or copper strips are used instead, to repair cracked glass in leaded lights. Over time, lead creeps under its own weight and causes panels to distort, particularly where rectangular rather than diamond-shaped pieces of glass, known as ‘quarries’, are used for plain glazing. Minor undulations contribute to the character of a window and generally don’t need repair. More serious distortion places further stress on the cames, which may then lift from the glass, increasing the risk of breakage. It also traps moisture, accelerating the decay of both the glass and the ferramenta. It may be possible to reduce distortion in situ, but in the severest cases panels will need to be laid flat to be repaired. Installing extra ferramenta can help prevent further buckling. If cames are corroded or have major fractures, the whole panel will need to be taken to a specialist workshop for careful rebuilding. Accidents and careless painters can lead to scratches on your windows. These can be polished out with a soft cloth using a mild rubbing compound such as jeweller’s rouge or, with a little more effort, a metal cleaner (such as Brasso). DIY buffing kits are also available. Deeper scratches (those that catch your fingernail if you run it across the glass) are best left to specialist scratch removal firms.